We reported a few days ago about the Android 4.1.2 update for the Galaxy S III, which brings with it Samsung’s Premium Suite features, features that are basically borrowed from the bigger Galaxy Note II. 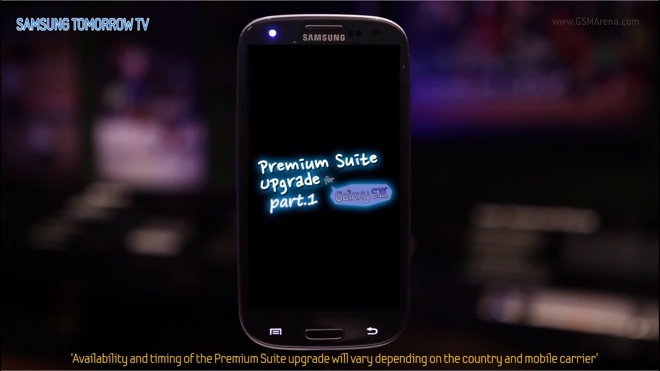 Now Samsung has released a video that showcases some of the features in this Premium Suite upgrade. It’s a multi-part series of videos and the first of the lot has been uploaded on YouTube. Among the features demonstrated in the video are the Page Buddy feature, which opens a new homescreen with the respective widgets when you connect an accessory, contextual image tagging, multi-view app mode, auto share shot, reader mode and Facebook lock ticker. And this is just part 1 of the series, so there’s going to be lot more to come.